Over 50 years after the suicide of Alan Turing, the British Prime Minister Gordon Brown has issued a public apology over the way that Turing (like many others in that period) was hounded, vilified and subjected to clinical intervention, because of his homosexuality. Brown referred to, “appalling treatment of a real war hero”. Turing is acknowledged as the father of the computer, having modelled the idea of computer science way back in the 1930s. One of the measures of artificial intelligence (AI) is still known as the Turing Test, as yet unachieved, when a human can ‘converse’ with a computer and be unable to tell that it is a machine. In recent years, there has been the gradual revelation of Turing’s huge contribution to the cracking of the German Enigma code, believed to have shortened the second world war. What is far less known about Turing is that he was an avid long-distance runner, and finished fifth in the AAA Marathon Championships, the British trial race for the Olympic Games in London in 1948. Following an oblique reference ten years ago to Turing’s extra-curricular interest, ie running, in an agency story, I wrote the following (abridged) piece for the Financial Times. The pictures were supplied by JF ‘Peter’ Harding, secretary of Walton AC, for whom Turing competed with distinction. History abounds with examples of prominent figures who early in their careers excelled in the sports arena. Earl Alexander of Tunis, victorious British wartime commander of the North African campaign, won the Irish mile title. Urjo Kekkonen, long-time Finnish President was a national high jump champion. Crooner Johnny Mathis was a US Olympic high jump hopeful in the mid-1950s; and long before landing on the moon, Buzz Aldrin was shooting into space as one of America’s leading pole vaulters. And there are scores more. But Alan Turing, the Briton who was ‘father’ of the computer, and the man chiefly responsible for cracking the Germans’ Enigma code in the second world war, did it the other way round. He became a national class distance runner in his mid-thirties, when he had already made his mark as a mathematical genius. Although exceptional individuals like Turing are often drawn to physical exercise to escape their deeply intellectual work, few turn out as good at their sport as he did. Turing almost made the British Olympic team in 1948. Yet, given the weight of his extraordinary legacy, coupled with his cruel end – suicide, very likely linked to his homosexuality – it is hardly surprising that his brief athletics career has been largely forgotten. Turing had run occasionally as a schoolboy at Sherborne in Dorset in the mid-1920s. During his undergraduate years in Cambridge, he forsook running for rowing, but when he became a fellow at King’s College, he resumed running, sometimes venturing as far as Ely and back – more than 30 miles. 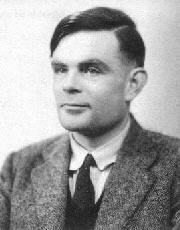 Turing got the idea for computable numbers and the Turing machine, forerunner of the computer while resting in a field at Grantchester during one of his long summer runs from King’s. 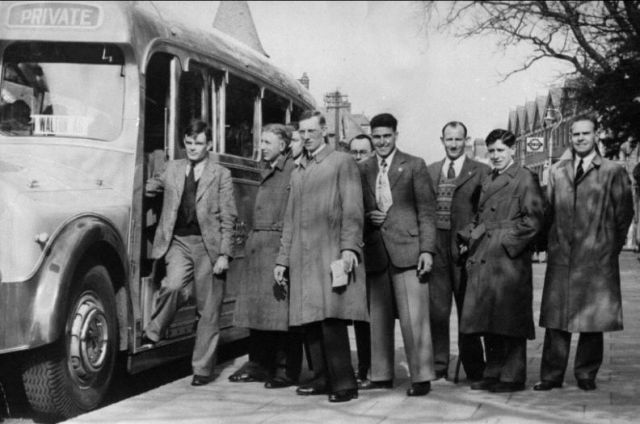 With the outbreak of war, he joined the Bletchley Park code-breaking centre, near Milton Keynes. He cycled a lot and took the occasional run. But only after the war, when he was tranferred to the National Physical Laboratory (NPL) at Teddington in west London, did he become a competitive runner. It was while he was working at Teddington and almost bumped into JF ‘Peter’ Harding, secretary of nearby Walton AC, that Turing was persuaded to join. “We heard him rather than saw him,” recalls Harding, now in his 70s.”He made a terrible grunting noise when he was running, but before we could say anything to him, he was past us like a shot out of a gun. A couple of nights later, we kept up with him long enough to ask who he ran for. When he said nobody, we invited him to join Walton. He did, and immediately became our best runner. “He was very popular with the boys, but he wasn’t one of them,” says Harding. “He was a strange character, a very reserved sort, but he mixed in with everyone quite well; he was even a member of our committee. We had no idea what he did, and what a great man he was. We didn’t realise it until all the Enigma business came out. We didn’t even know where he worked, until he asked us if Walton would have a match with NPL”. The only insight that Harding ever got into Turing’s remarkable mind came on a coach trip to a road race when, prompted by doubts about the aged club timekeeper, Turing mused to him about making a timing device using an electrical beam. As for Turing’s homosexuality, Harding recalls, “We never had any indication whatsoever. There was our dressing room, with 20 or 30 young men running around naked, darting in and out of the showers. He never approached one of them, invited them out for a drink or anything. “But again, looking back, there was one thing that I’ll never forget. We used to go on trips to London for the club spirit. We booked a show at the Prince of Wales’ theatre. We all went up there and had a meal, and went to the show afterwards. There were dancing girls…of course, the boys in the club, their eyes were bobbling out of their heads; they were all young lads. I looked across at Alan, and he was asleep”. In a letter to a friend, Turing said of his running, ‘This is a form of compensation for not having been good at games at school’. But Harding says Turing gave him a further reason. “I asked him once why he punished himself so much in training. He told me, ‘I have such a stressful job that the only way I can get it out of my mind is by running hard, it’s the only way I can get some release'”. Turing came close to representing Britain in the marathon at the 1948 Olympics. With three places open, he finished fifth in the qualifying race, the AAA Championships at Loughborough the previous year. His best time of two hours, forty six minutes and three seconds was just over 11 minutes slower than the eventual Olympic winner in an era when the marathon was far less popular than today, and when 10-minute gaps between top finishers were not uncommon. Shortly afterwards, Turing moved to a post at Manchester University where his running and mood swings prompted Lyn Irvine, the writer wife of his head of department to refer to him as ‘Mercury’. Turing’s end was less than glorious. In 1952, he was arrested and put on trial for a homosexual relationship – a criminal offence at the time. To avoid going to prison, he had to submit to hormone treatment, and kept under surveillance. Two years later he was dead – having eaten an apple dipped in cyanide. Following news of Prime Minister Brown’s apology last week for the ‘appalling treatment’ of Turing, Stephen Keynes, a younger contemporary at Cambridge University paid this lovely radio tribute to Turing. “His real passion in life, apart from the computer was to run in the Olympic Games, in the marathon. I was probably 20 at the time, but I sometimes felt a lot older, because he had this extraordinary naivety, like a 15 year old…. he bounced when he talked, (he had) tremendous enthusiasm. “His suicide was an absolutely awful event, because he was somebody without any evil at all, there was no cruelty, nor wish to bully or patronise anybody, he was very open, very naïve. I was absolutely horrified, because I knew what he’d done in the war, of the importance of Enigma. Not from him, other people told me. And to crucify him when he was a person totally innocent of any evil wishes, was absolutely monstrous. I was horrified that society could do that to an individual who’d given so much”. ← BOYS WILL BE BOYS…. WON’T THEY?